The destiny of this state and our nation is entrusted to “We the People.” To keep Texas the bastion of liberty in America, we need to shore up cracks in our democratic process. Faith in our democracy is linked to the people’s trust in their elected officials. Voters deserve to know if we are working for ourselves or the people who elected us. We should end the practice of government deducting union dues from the paychecks of employees. Taxpayer funds should not be used to support the collection of union dues. The federal government should fulfill important but limited responsibilities as enumerated in the Constitution. On everything else, Texans should govern Texas. 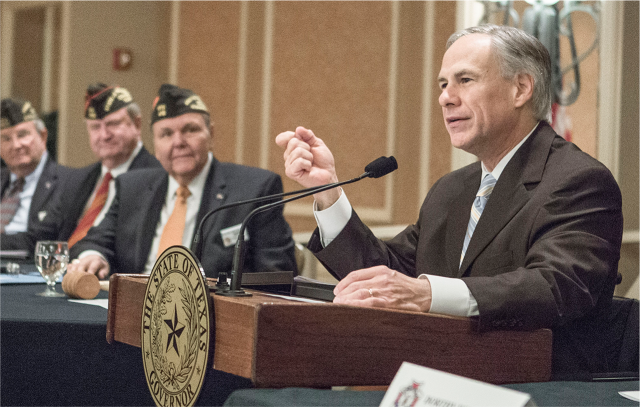 Governor Greg Abbott today issued an executive order establishing the Governor’s Committee to Support the Military. Governor Greg Abbott today released his second “Report to the People of Texas,” which highlights the legislative, economic, educational, and public safety achievements over the past year. Governor Greg Abbott today spoke at the annual Texas Rally for Life at the State Capitol where thousands in attendance joined in their commitment to protecting the rights of the unborn and advocating for pro-life policies in Texas. Texas First Lady Cecilia Abbott today hosted a Listening Session in conjunction with Adoption Month, bringing together stakeholders for an open dialogue on the issues facing the state’s child welfare system. Governor Greg Abbott today signed House Bill 215 (HB 215) to strengthen abortion reporting requirements, specifically relating to minors. Governor Greg Abbott today signed House Bill 214 (HB 214) which limits insurance coverage for abortion procedures. Governor Greg Abbott today signed House Bill 13 (HB 13) to expand reporting requirements for complications resulting from abortion procedures. The following lawmakers have declared their support for HB 215 or SB 73, which address Governor Abbott’s call for improved reporting requirements related to abortions. The following lawmakers have declared their support for HB 13 or SB 10, which address Governor Abbott’s call for expanding reporting requirements for complications resulting from abortion procedures. The following lawmakers have declared their support for HB 14 or SB 4, which address Governor Abbott’s call to prohibit local and state government from providing taxpayer funds to abortion providers.